The two largest private prison providers in the U.S. each rake in tens of millions of dollars every year. How do they make their money, and what agreements are in place to protect their profits? 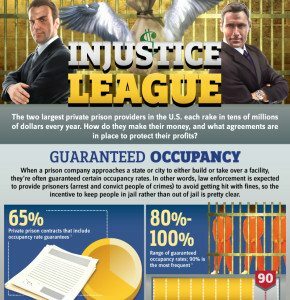 When a prison company approaches a state or city to either build or take over a facility, they’re often guaranteed certain occupancy rates. In other words, law enforcement is expected to provide prisoners (arrest and convict people of crimes) to avoid getting hit with fines, so the incentive to keep people in jail rather than out of jail is pretty clear. Which candidates have been the biggest beneficiaries of lobbying by private prison companies?